Excerpts from Bunmiblair.blogspot.com's interview with new Plateau United coach Abdul Maikaba . 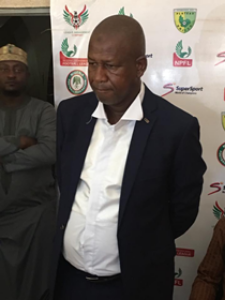 BUNMIBLAIR: Congratulations on your new job, but why the switch from Akwa United FC to Plateau United? MAIKABA: Really I was supposed to continue with Akwa United because we have built a good team and the best way to keep this on was for me to renew my contract. Unfortunately back home, I have something that has been distracting my attention from the job, it relates to my family. BUNMIBLAIR: What is the target you have set for yourself at Plateau United? MAIKABA: We have to consolidate first, win the league and that will qualify us to the continent. We will then try to make Nigeria proud on the continent. At present, I believe myself and Plateau United both has experience in the continental competitions and our combination will work very well. BUNMIBLAIR: Are you saying you hope to win the league in your first season at Plateau United? MAIKABA: Of course, despite the fact that it could be an abridge league, we don’t have time, we have to find solutions to that. Build the team as quick as possible, try to win the league first time and from there I believe the team will be improving. BUNMIBLAIR: We know that most coaches move around with their best players, will you take some players from Akwa United to you present team? MAIKABA: It depends, I don’t intend to bring a player that is on contract at Akwa United no matter what, because I don’t want to destroy what I have built. But if the contract of a player runs out and he doesn’t want to renew it, it is another thing entirely. So, we can look into that, if he can help in the building of my new club, Plateau United, I will be very happy. BUNMIBLAIR: I don’t know if you intend to still be in the job let say in the next 10 years, if you intend to, what’s your target as a coach? MAIKABA: My target is to coach the Nigerian Senior National Team, the Super Eagles. After that, I will start proving what I can do at the world stage and then I can quit and go back to my family. Though I have never applied for a job outside Nigeria, but it will be challenging to experience what it feels like to work outside Nigeria. If the opportunity arises, I will be very ready to do it, depending on the offer on ground. BUNMIBLAIR: Thank you very much coach and we wish you the best now and in the future.